One of my favorite things to eat in New York come winter is a big, steaming bowl of ramen (and not the package stuff that you subsisted on in college). A few years ago ramen became the trendy food du jour and, lucky for us, ramen spots popped up all over the city. In Israel it’s one of the foods that I find myself missing, especially when the weather gets chilly (yes, that happens here) or when I have a cold. Although I have yet to visit Japan, from what I understand every region of the country has its own version of this comforting noodle soup. I set out to make a miso ramen with whatever ingredients I had on hand. While my version may not be completely authentic, it was absolutely delicious and filled my ramen void quite nicely. Some spinach thrown in at the end would be a lovely addition as well. This hearty soup is a meal in itself, and can easily be made vegan and vegetarian by omitting the fish sauce. This delicious vegetarian ramen is easy to prepare and filling enough for a cold winter's night. Feel free to use whatever vegetables and noodles you have on hand to personalize this warming soup. Toss the squash with the olive oil and a bit of salt. Spread evenly on a baking dish and transfer to the oven. Bake for about 20 minutes, or until tender. Remove from the oven and set aside. Meanwhile, hard or soft boil the eggs, depending on your preference (I like mine a little softer). Peel and slice in half vertically. Cook the noodles in a large pot of boiling water until very al dente. Drain, rinse in cold water, and set aside. Put the broth, soy sauce, and fish sauce in a large pot and bring to a boil. Add the miso and chili oil, if using, and stir until fully incorporated. Lower the heat, add the tofu, and simmer for 5 minutes. Add the noodles and squash and remove the soup from the heat. Ladle the soup into bowls. Top with half an egg and scallions. Parve, and vegetarian if fish sauce is omitted. Vegan if the fish sauce and egg are omitted. Ahh Katherine this looks sooo good and so perfect for these cold nights we are having! I totally understand and totally agree! Nothing better than a good bowl of ramen! Oh, man, what a gorgeous bowl of deliciousness! As always, your food styling is impeccable! Thanks Marie!! My pleasure 🙂 I need to make this again soon for sure. Sounds lovely and warming – I can see though how it might be hard to get these kind of dishes in Israel. I miss many of the wonderful noodle soup dishes from Japan, and butternut squash sounds like a wonderful new pairing for me. It’s funny, we have all the ingredients readily available, and tons of sushi restaurants, but ramen is hard to come by. 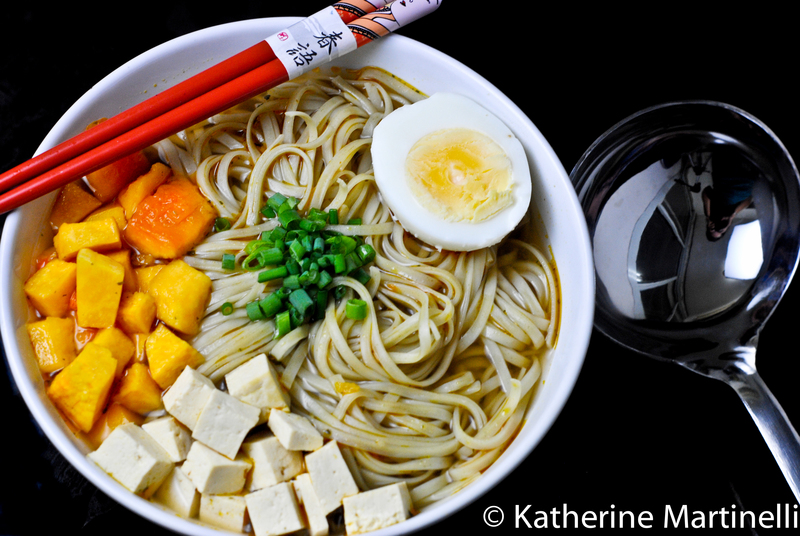 This is such a creative dish-love the mix of butternut squash with the ramen noodles! Wish I had thought of this, but you have inspired me to think of new ways to improve on the standard ramen noodle dish. However, this one is the first to make-great post. Thanks Susie!! I could totally go for another bowl! Doesn’t matter if it is not completly authentic. This dish rocks! It looks so healthy and feel-good. Something I need after the holdiday season. Haha, thanks! Yes, we can all use more dishes like this after the holidays! Great pictures! I love ramen, and have been playing around with it a bit (I’m about to get a lot more serious). Good recipe. BTW, how much broth do you use? I’m not seeing the quantity (maybe I missed it?). Have you read David Chang’s Momofuku? Great ramen discussion (very bacon-oriented, if you like that sort of thing; which I do). OK, I’m clearly blind. I went back today to look again at the recipe, and the quantity of broth is prominently there. Sorry about that . . .
You are not blind – very observant in fact! I was indeed completely missing the broth from the ingredients (what a gross soup that would have been!) and as soon as I saw your comment I went back in and added it. I’m just behind in replying to comments. So thank you!!! And I’ve looked through the Momofuku cookbook but don’t have it. Need to get it! Wow – that looks absolutely amazing! I love this sort of dish and there’s something about an egg in a dish that makes it so rich and decadent….beautiful! Thanks Ann!! I totally agree about the egg – it makes it so much prettier and more special! Thanks Christy!! It’s a healthy quick fix indeed! Thanks Kiran! I also love miso soups and noodles, and come winter that’s practically all I crave! what an interesting recipe!! great photos! looking forward to try it. Thanks! I hope you enjoy it – let me know how it turns out! Thanks Judee!! It is definitely soothing for the cold I can’t seem to kick this winter! That looks nourishing and very comforting for this weather. Fabulous dish. This soup looks amazing – absolutely perfect for curling up with on a chilly day! Love all the flavors – yum! Thanks Sara! 🙂 I completely agree – I’d love to curl up with another bowl of it now! Aww thanks Abby! I’m so happy to hear that! I want one bowl too! It looks amazing and perfectly comforting for the ice cold days! Thanks Beti! I love butternut squash in anything and it turned out to be great with the tofu in this. This dish is beautiful to look at. Can’t wait to give it a taste! Looks filling and delicious with lots of great nutrients! Wow, what a prefect dish. I just love miso and noodles, honestly I could eat that eveyday. The chili oil is a nice kicki too. Thanks Suzi! I could eat it every day too! Yes, just that little bit of chili oil really did add a nice kick, which worked well to help kick my cold! You know that Vegan means no eggs right? Yes of course, I figured that vegans would know to omit the egg but I forgot to add a note – have just added one now. Thanks! This is heaven in a bowl! We watched Tampopo last week (one of my favorite movies) and immediately went out for bowls of ramen. I can’t wait to try yours! Yay for ramen! I can eat ramen once a week! Among all the flavors I think I love miso and tonkotsu (pork) ramen most. Additions of butternut squash and tofu is interesting! It definitely catches vegetarian’s attentions! Wonderful bowl of ramen! Yay for ramen indeed!! Mmmm miso and pork is so good! Do you have a trick to peel soft boiled eggs?? I tried twice & failed. Katherine I tried to find fish sauce at Eden yesterday and they had no idea what I was talking about (“sauce for fishes?”). Where was it? I guess I’ll use chicken broth instead? So the chicken broth was probably OK. Substituting sesame oil for chili oil was a mistake. Way too many clashing flavors. Still reminiscent enough of Ramen to want to eat it though, thanks for the recipe! Sorry for not getting back to you sooner! You probably could have left both the fish sauce and the chili oil out and it would have been ok. Or you could substitute soy sauce for fish sauce if need be. They have fish sauce at Tiv Taam for sure (it may not be kosher, I don’t know). I’m glad it was still edible!